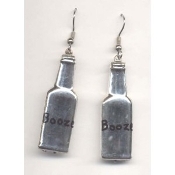 BOTTLE of BOOZE LIQUOR EARRINGS - Bar, Restaurant, Bartender, Cocktail Waitress Jewelry - METALLIC SILVER-tone Plastic Charm - Approx. 1-5/8" Tall. WILD THING!